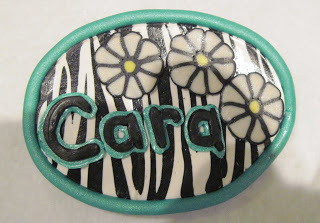 I am really proud of my latest jewellery and was thinking I must sort out the photographs show I can show you properly. Then today I was emailed some photographs by a friend to use on my blog (post coming soon), they are great photos and I just couldn’t put them up against my poorly lit ones so the ‘sorting out a photography set up’ jumped up the to do list! See why I need to sort it out… Here’s the rainbow owls photograph from yesterday, I took it on my work bench with my normal room lighting. 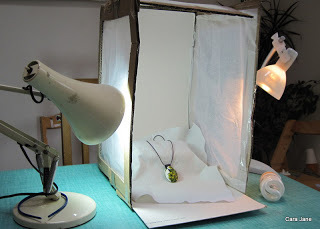 I wanted to make a light box from a cardboard box (as demonstrated on Kate Tracton’s Shibori Girl blog) but typically we don’t seem to have any boxes kicking around today. Whilst researching how to set up jewellery photo shoots previous I seem to remember someone using a transparent plastic storage container so thought I would give that a go whilst I find a box. I switched my usual light bulb to a full spectrum daylight bulb and tried lighting from the top. Plastic box and daylight bulb light from the front photo – as shot! Better definitely but there is a bit of ‘glare’. So my next step is to track down a suitable cardboard box to make a light box and another lamp (with daylight bulb of course) and try lighting from the side. So hopefully you will be enjoying some better photographs from now on.